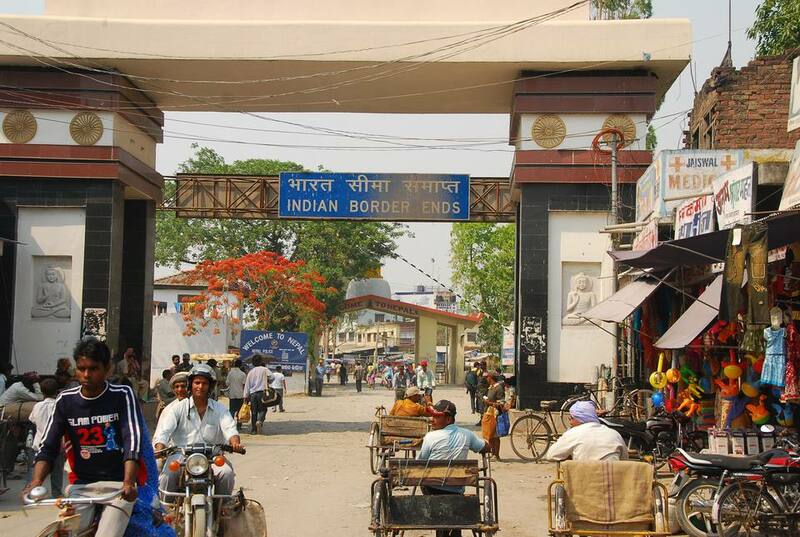 The Sunauli border is the most popular entry point from India to Nepal, and vice-versa, when traveling overland. However, there's nothing nice about it there. Nothing nice at all. On the Indian side, Sunauli is a dusty town in a poor and inhospitable part of Uttar Pradesh. The road through is clogged with heavily laden trucks and there are touts everywhere. It's recommended that you make the border crossing as quickly as possible. Here are some tips for doing so. If you arrive at the Sunauli border on the Indian side, you'll have most likely come by bus from Varanasi or Gorakhpur (the closest main train station, about two hours away). The buses drop passengers in a parking lot a few hundred meters from the border. You can walk, but if you don't want to, negotiate a cycle rickshaw to take you across. Ignore anyone trying to sell bus tickets, it's much better to get them on the Nepal side. For foreigners, first stop is the Indian immigration office to get a departure stamp in your passport. You'll find it on your right hand side before the border. Second stop is the Nepal Immigration Office at Belahia, Bhairahawa, on the other side of the border. It's again on your right hand side, a short distance after crossing. Nepali visas on arrival are issued there (see tips below for more information). Lastly, you'll want to organize onward travel. Pokhara and Kathmandu are roughly the same distance away, about eight hours or more. There are a few options for getting there: shared jeep or minivan, or bus. There's a bus station at Bhairahawa, a few kilometers from the border (take a cycle rickshaw). However, plenty of travel agents will approach you with offers of transport before that. Day buses from Sunauli leave in the morning, up until 11 a.m., so aim to get there early. Night buses, departing in the afternoon, take longer and arrive at their destination the next morning. You'll also miss out on stunning views! It's worth getting out of unappealing Gorakhpur as fast as possible too, so try to avoid staying overnight there (although it's preferable to Sunauli). Buses to Sunauli depart near the railway station in Gorakhpur. Exit the station and walk straight across to the main road (ignoring auto rickshaw drivers that approach you). You'll find a few buses parked along the road to your right, near the statue of a guy on a horse at the intersection. Ask the drivers which one is going to Sunauli. The buses run all day, starting from about 6 a.m. They leave approximately every hour, or as soon as they're full. If you do need to stay in Gorakhpur, there's a row of guesthouses along the main road. Most people arrive at the Nepali side of the border in the afternoon, having taken an early morning bus from Kathmandu. After clearing immigration, continue for about five minutes, and you'll find a U.P.S.R.T.C government bus stand on your right. Look for U.P.S.R.T.C buses with a blue stripe (the green buses go to Gorakhpur and the red ones go to Varanasi). Get on, and pay when you're aboard. Buses to Gorakhpur cost about 100 rupees per person and will depart according to timetable, approximately every half hour. Although less than comfortable, you don't have to worry about being hassled and ripped off by private bus operators. Shared jeeps also run to Gorakhpur, but don't leave until full...very full. Often a dozen people will be rounded up and crammed in! The bus, although decrepit, is usually a better (and cheaper) option. If you're headed to Varanasi either Friday or Sunday morning, the direct express train from the nearby small town of Nautanwa is recommended. It departs at 11.15 a.m. and takes around seven hours. (This train isn't a good option if going from Varanasi to Sunauli, as it arrives in Nautanwa at 10.35 p.m.). It's possible to walk through the border 24 hours a day, although it closes to vehicles at 10 p.m. and reopens at 6 a.m. However, it's best not to arrive there late at night. You may need to go in search of an immigration officer. Plus, it can be dangerous, particularly on the Indian side. There are often reports of tourists being forced, and threatened with beatings, to buy overpriced onward bus tickets and train tickets that they don't need. Ignore anyone that approaches you. When going from India to Nepal, carry $US with you to pay for your visa. The current cost is $25 for 15 days, $40 for 30 days, and $100 for 90 days. Currency exchange facilities are available in the vicinity of the Nepal Immigration Office, but watch out for scams involving fake money and black market operators giving poor rates. Indian rupees of denominations greater than 100 (ie. the new 200, 500 and 2,000 rupee notes) can no longer be used or exchanged in Nepal. Make sure you carry a couple of passport sized photos for your visa application. If you're an Indian citizen, you don't need a visa or a passport to cross the border. Acceptable documents include ration card, voters ID, and driver's license with photo. However, you can cross the border anyway, no one will stop you. The same is the case for foreigners, so do keep an eye out for the immigration offices in order not to miss them! Citizens of the following countries aren't granted visas on arrival for Nepal: Nigeria, Ghana, Zimbabwe, Swaziland, Cameroon, Somalia, Syria, Liberia, Ethiopia, Iraq, Palestine, and Afghanistan. Do note that if you're crossing from Nepal to India, Indian e-visas aren't accepted at the border. You'll need to apply for a visa at the Indian Embassy in Kathmandu. The process takes about five working days and requires three visits.